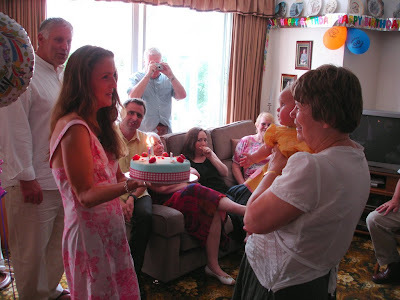 For my mum's sixtieth, my sister and me (and our spouses), in cahoots with my mum's cousin Jan, threw her a surprise birthday party at her house on the preceding Saturday (meaning she got to tidy up afterwards). I was surprised but chuffed that she didn't guess there was something going on. 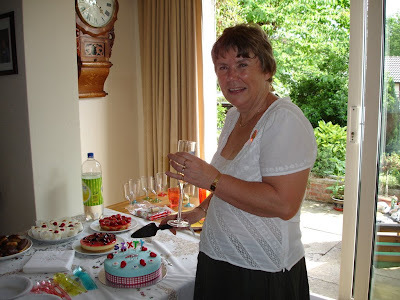 Jan had arrived in the morning and insisted they went out, and I rang mum on her mobile around 1.30pm to say Anne, ThingOne and I had popped in on the off chance. We'd previously said we'd come for lunch on the Sunday and I now told her we could no longer make that. I felt bad lying to her, but we knew mum wouldn't want to miss seeing ThingOne, and she and Jan raced back. Mum was pretty shocked by the crowd who greeted her when she got in. It was all great fun. Good to see her surprised and good that everyone wanted to make the effort to give her a good day. Mum seemed to enjoy herself. As a bonus she got to show her granddaughter off to her friends and family for the first time (for most). ThingOne wasn[t in a very good mood though as it was too hot for her, poor hot Bean.